St Bridget's Roman Catholic Church in East Falls. 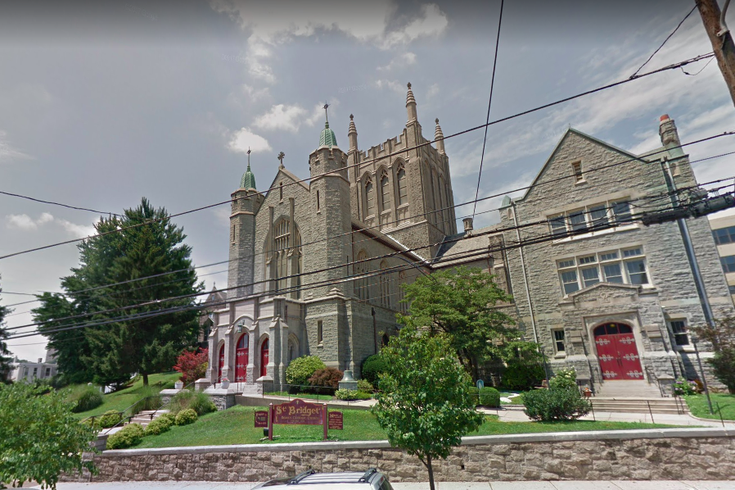 A Philadelphia Catholic church says its officials had nothing to do with a sign placed outside the parish that denounced gay marriage. A photo of the sign outside St. Bridget Catholic Church in East Falls was posted on the Next Door website, which people can use to post about a wide range of goings-on in their neighborhoods. The sign read: "God's Marriage = 1 Man + 1 Woman." It was hung over the church's main sign on Midvale Avenue. In a Facebook post Saturday, the parish said they didn't put the sign there, adding that everyone is welcome at the church. "The sign on the lawn was NOT placed there by any of St. Bridget Staff or Clergy," the Rev. Robert Feeney wrote. "Please know that ALL are always welcome at St. Bridget Parish." The Catholic Church's official position on marriage is that it can only be between a man and a woman. Pope Francis has said that the church should embrace gay and transgender people, although he has maintained the church's firm opposition to, as he put it, such "tendencies." While there is debate among Catholic leadership as to whether gay marriages can receive a church blessing, Philadelphia Archbishop Charles Chaput said earlier this year that local priests and deacons should not take part in such ceremonies. When gay marriage was legalized in Pennsylvania in 2014, Chaput called it a "mistake."